The aim of the present study was to measure organic acid, especially lactic acid, concentrations in contents of the stomach and intestine of wildcaught and cultured ayu (Plecoglossus altivelis) and wild-caught seema (Oncorhynchus masou), and of the stomach as well as anatomically defined three intestinal segments of wild ayu. The concentration of total SCFA in the present study was approximately one–tenth that in the mammalian hindgut. The organic acid concentration did not vary much among fish categories. Lactic, acetic, formic, succinic and propionic acids, but not n-butyric, isobutyric or iso-valeric acids were detected. Lactic acid concentration was by far higher than those of other organic acids. Organic acid concentratios were higher in all intestinal segments than in the stomach of wild ayu. The above results showed that lactic acid is the main product of the microbial breakdown of carbohydrates in the gut of florivorous (wild ayu), omnivorous (cultured ayu) and faunivorous (wild seema) teleosts and that the intestine is the main site of microbial breakdown of carbohydrates to organic acids, at least in wild ayu. The existence of short-chain fatty acids (SCFA) such as acetic, propionic, n-butyric and n-valeric acids in the gut contents indicates the microbial breakdown of carbohydrates . Previous papers have reported various concentrations of SCFAs in the gut contents of teleost species , indicating the microbial breakdown of carbohydrate. Lactic and less frequently succinic acid can be the major product of carbohydrate breakdown in the rumen or intestine in mammals . However, there is little information on concentrations of lactic, succinic or formic acid in the teleost gastrointestinal tract. Ayu (Plecoglossus altivelis) is an annual freshwater fish in Japan . Mature wild ayu in the river is a typical florivore feeding mainly on diatoms and blue-green algae growing on rock surfaces in the river bed . Commercially cultured ayu is an omnivore feeding commercial diets consisting mainly of fish meal and starch, diets rather different from their natural diet . Thus, wildcaught and cultured ayus have the same genetic background but consume different diets. Wild seema (Oncorhynchus masou) share the same habitat as mature wild ayu, and are of similar body size to wild ayu, but is a faunivore feeding on fry and aquatic insects [3,7]. Both species have a short intestine relative to body length. Thus, the retention time of digesta in the intestine should be short in these species, which in turn means that the dilution rate of intestinal contents should be high. A high dilution rate in the gut generally favors lactic acid fermentation in mammals , but whether lactic acid accumulation occurs in the intestine of teleosts with a short gastrointestinal tract is not known. Thus the major purpose of our study was to examine if lactic acid accumulates in the gut of three categories of teleosts (wild seema and wild and cultured ayu). Besides, we compare organic acid composition among the three categories of teleosts for the influence of species (ayu vs. seema), habitat (wild ayu vs. cultured ayu), and diet (wild ayu vs. wild seema) on organic acid composition. Thus, we measured organic acids including SCFA and non-SCFA including lactic, succinic and formic acids in the stomach and intestine of wild ayu, cultured ayu and wild seema. Microbial digestion in mammals is confined to the forestomach and hindgut in mammals , however, such a heterogeneity is yet obscure in teleosts. Thus, the second purpose of the present study was to examine if the organic acid concentration is heterogenous among anatomically defined gut segments of wild ayu. All the experimental fish were caught under written permission for the harvest of fish from fisheries cooperative association of Ogunigawa in Yamagata prefecture, Japan, in 2009, 2012 and 2015. Teleost is not covered by Act on Welfare and Management of Animals. Thus, studies using teleost are outside of the role of animal ethics committee in Japan. However, we tried to follow the regulation for mammals as far as possible. Wild ayu (17.2 ± 1.4 cm, 43.8 ± 11.3 g, n=20) and wild seema (18.5 ± 2.9 cm, 63.2 ± 24.7 g, n=25) were caught by fishing with live decoy and by fishng with live bait in Oguni river (38°43'54.5" N, 140°23'31.2" E), Yamagata prefecture, Japan in September, 2009 and 2015, respectively. Live cultured ayu (16.9 ± 1.0 cm, 43.2 ± 9.8 g, n=15), raised from the same population as wild ayu, were purchased from an ayu farmer (Mogami Ayu Center), in Mogamimachi, Yamagata prefecture 999-6214, Japan, in September, 2009. All fish were killed by a blow to the head and placed on ice and transferred to the field laboratory in Shinjo, Yamagata prefecture within 1 hour. We confirmed cardiac arrest in all fish before sampling. Fresh intestinal contents from every 5 fish were pooled in a sterilized test tube and cooled immediately in an ice-water bath to be stored at -20°C until organic acid analysis. Such a sampling was repeated to obtain numbers of replicates of 3, 4 and 5 for wild ayu, cultured ayu and wild seema, respectively. We used wild ayu (18.6 ± 1.6 cm, 66.6 ± 13.8 g, n=4), which were caught as above in September, 2012. We also collected algae (n=3), the feed of ayu, from the rock surface at the sampling site of the wild ayu. All fish were killed and handled as in Experiment 1. The intestine was divided into three segments (segments 1, 2 and 3), using the entrances of the proximal and distal branches of celiaco-mesenteric artery as the demarcation points (Figure 1). Fresh contents of the stomach, and segments 1, 2 and 3 of the intestine were collected in a sterilized test tube (Eppendorf Japan, Tokyo). These intestinal contents and algae were cooled immediately in an ice-water bath and were frozen, then stored at -20°C until analyses. The pH of stomach and intestinal contents was measured with a pH electrode (B-212, Horiba Kyoto). The concentration of organic acids (succinic, lactic, formic, acetic, propionic, n-butyric, iso-butyric, n-valeric and isovaleric acids) in samples of the two experiments was quantified by ion-exclusion chromatography using high-performance liquid chromatography . Briefly, the contents were expelled from test tubes and diluted with 400 μL distilled water. Fifty μL crotonic acid solution (1 gÃ£ÂÂ»L-1 in 10 mmolÃ£ÂÂ»L-1 NaOH) as an internal standard was added. An equal volume of chloroform was added to this mixture, and then centrifuged at 10,000 rpm for 10 min at 4°C. The supernatant was syringe-filtered through a 0.2 μm filter (13CP020AN ADVANTEC, Tokyo). Of this filtrate, 50 μL was injected onto a SCR-102(H) column (30 cm × 8 mm I.D; Shimadzu Corporation, Kyoto) equipped with a guard column. The mobile phase was 5 mmolÃ£ÂÂ»L-1 p-toluenesulfonic acid (0.8 mLÃ£ÂÂ»min-1) (Wako pure Chemical Industries, Ltd., Osaka). Peaks were analyzed using an electronic conductivity detector (CDD-6A, Shimadzu Corporation, Kyoto) with 100 μmolÃ£ÂÂ»L-1 EDTA plus 20 mmolÃ£ÂÂ»L-1 Bis-tris in 5 mmolÃ£ÂÂ»L-1 p-toluenesulfonic acid (Wako pure Chemical Industries, Ltd., Osaka) at 0.8 mLÃ£ÂÂ»min-1 of flow rate and quantified using a MAC integrator II (ver. 1.4.5) (VARIAN, USA). All values are given as means with standard errors of the mean (SD). All statistical analyses were conducted using a computer program JMP 5.0.1J (SAS Institute Inc., Cary, NC, USA) on a Macintosh computer. Differences among means were considered significant different when the error probability of Turkey’s honestly significant difference comparisons test  after preliminary one-way analysis of variance (ANOVA) was smaller than 0.05. Predominantly lactic acid and to a lesser extent acetic, formic, succinic and propionic acids were detected, but not n-butyric, iso-butyric or iso-valeric acids in the intestinal contents of all fish (Table 1). Concentrations of lactic, acetic, formic and succinic acids in intestinal contents did not differ significantly among three fish categories (Table 2). Mean total organic acid concentration, i.e., the weight sum of detected organic acids, in intestinal contents did not differ among the three fish categories (Table 2). Neither fish species (ayu vs. seema) nor habitat and feeding habit (wild vs. cultured ayu) of ayu had significant effect on concentrations of lactic, acetic, formic and succinic acids (p>0.05) (Table 2). We detected lactic, acetic, formic, succinic and propionic acids, but not n-butyric, iso-butyric or iso-valeric acid. Lactic acid was the predominant acid in the contents of all gut segments (Table 2). Organic acids were not detected in extracts of the algae. Total organic acid concentration in the segments 1, 2 and 3 was significantly higher than in the stomach (p<0.05) (Table 2). Lactic acid concentration in the segment 1 and segment 2 was significantly higher than in the stomach (p<0.05) (Table 2). Concentration of lactic acid did not differ among three intestinal segments (Table 2). Acetic and formic acids concentrations in the segment 3 were significantly higher than in the stomach and segment 1 (p<0.05) (Table 2). The pH in contents of segment 1, segment 2 and segment 3 was significantly higher than in the stomach (p<0.05) (Table 2). The general presence of lactic, acetic and formic acids, but not of iso-butyric acid or iso-valeric acid (Table 2) indicated the bacterial breakdown of carbohydrates, but not of protein, in ayu and seema which is in accord with previous authors . In other words, the predominant substrate for gut microbes should have been carbohydrates even in cultured ayu fed on fish meal-based diets or in the insectivorous wild seema. The concentration of total SCFA in the present study, as well as previous studies on teleosts (Tables 1 and 2), was approximately one–tenth that in the mammalian hindgut  suggesting the less importance of microbial digestion in teleosts than in mammals. The predominant organic acid in all gut segments was lactic acid (Table 2). However, previous authors did not measure lactic acid concentration in fish intestinal contents (Table 1). Accordingly, we are not sure if the high concentrations of lactic acid in our study reflect the general condition in the teleost intestine. By ignoring lactic acid, previous authors may have underestimated microbial production of organic acids in the fish intestine (Table 1). The short tubular intestine of ayu, or seema without sacs, valves or expansion  should favor rapid transit of contents and therefore high dilution rate may partly be responsible for the high lactic acid concentration (Table 2) in the present study. The pH of stomach contents was approximately 4.5 (Table 2), too low to convert lactic acid to acetic or propionic acid . The low pH in the stomach contents may explain the accumulation of lactic acid in the stomach. The higher pH of the intestinal contents cannot explain intestinal lactic acid accumulation by low pH. High dilution rate  may play the key role in lactic acid accumulation in the intestine. The existence of organic acid in the gastric contents (Table 2) is indicative of microbial fermentation in the stomach, and is in accord with previous studies in teleosts . The absence of organic acids in the algal extracts suggests that the organic acids in the gastric contents were not derived from the algal diet. However, the higher organic acid concentration in all intestinal segments than in the stomach (Table 2) suggests that the whole intestine is the main site of microbial digestion, at least in wild ayu. The above results showed that lactic acid is the predominant organic acid produced from carbohydrates in the gut of florivorous, omnivorous and faunivorous (insectivorous) teleosts and that the intestine, but not the stomach, is the main site of microbial breakdown of carbohydrates to organic acids, at least in wild ayu. Our deepest appreciation goes to Prof. Minoru Kihara, Tokai University and Prof. Ian D. Hume, University of Sydney who provided carefully considered and valuable comments. Macfarlane GT and Gibson GR. Microbiological aspects of the production of short-chain fatty acids in the large bowel: Physiological and Clinical Aspects of Short-Chain Fatty Acids. Cambridge University Press, Cambridge. 1995; pp: 87-105. Clements KD and Choat JH. Comparison of herbivory in the closely-related marine fish genera Girella and Kyphosus. Marine Biol. 1997; 127: 579-586. Nagaraja TG and Titgemeyer EC. Ruminal acidosis in beef cattle: The current microbiological and nutritional outlook. J. Dairy Sci. 2007; 90: 17-38. Kuroki M, et al. Migratory history of wild and released ayu (Plecoglossus altivelis) in the Kurobe River, Japan. Coast. Mar. Sci. 2006; 30: 421-425. Iguchi K and Hino T. Effect of competitor abundance on feeding territoriality in a grazing fish, the ayu Plecoglossus altivelis. Ecol. Res. 1996; 11: 165-173. Nakagawa H, et al. Effect of different dietary structure on growth and gut contents in cultured ayu Plecoglossus altivelis. J. Grad. Sch. Biosphere Sci. 2004; 43: 15-24. Kato F. Life histories of masu salmon and amago salmon (Oncorhynchus masou and Oncorhynchus rhodurus). Pacific Salmon Life Histories. UBC press, Vancouver. 1991; pp: 447-520. Stevens CE and Hume ID. Microbial fermentation and synthesis of nutrients and the absorption of end products. Comparative Physiology of the Vertebrate Digestive System. 2ndedn, Cambridge University Press, Cambridge. 1995; pp: 188-226. Hoshi S, et al. Galacto sylsucrose and xylosyl fructoside alter digestive tract size and concentrations of cecal organic acids in rats fed diets containing cholesterol and cholic acid. J Nutr 1994; 124: 52-60. John CF. One-way analysis of variance. Biological Data Analysis, Oxford University Press, New York. 1993; pp: 26-28. Nakagawa H, et al. 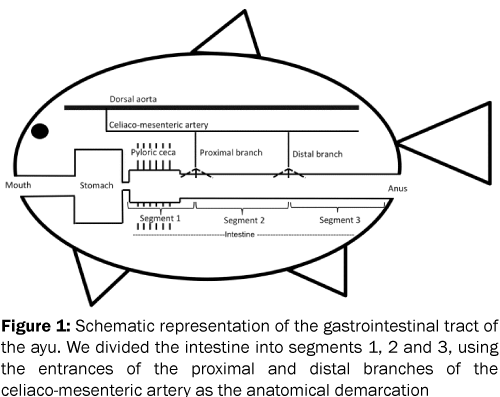 Characterization of the digestive tract of wild ayu. Fish Sci 2002; 68: 341-346. Ushida K and Sakata T. Effect of pH on oligosaccharide fermentation by porcine cecaldigesta. Anim Sci Technol 1997; 69: 100-107. Mountfort DO, et al. Hindgut fermentation in three species of marine herbivorous fish. Appl Environ Microbiol. 2002; 68: 1374-1380.